November is such a caring month. Not only do we have Thanksgiving at the end of the month, it’s also #NationalGratitudeMonth, and today we have one of my favorite “celebrations,” #WorldKindnessDay. I’m sure many of you have felt like me, and have seen a lot of negativity getting spread in the world today. Candidly, there are times that if I didn’t have to be on/use social media in my professional life, I might stop using all together. Still, I know that there is good out there. I have friends that remind me of this fact often, strangers that go out of their way to be friendly, and acquaintances who have helped simply because I asked. Categories: Random Acts of Kindness | Tags: 10 Easy Ways to Show Kindness, How you can spread kindness today, National Gratitude Month, Random Acts of Kindness, The Appreciation Factor, World Kindness Day | Permalink. Happy summer! I’ve been looking forward to the first day of summer for a long time. As I said to someone yesterday on the phone, I may like the first day of summer even more than my birthday! I’ve got some great Thankful Thursday stories to share today. You’ll note that two are around writing; I was more inspired by National Stationary Month than I realized. Two others focus on middle schoolers really stepping up. As you know, Thankful Thursdays are stories, people, companies, and videos that move me, and which exemplify appreciation, kindness, or those making a difference in the world. These five stories really spoke to me and I hope they’ll speak to you too! As an added bonus that’s in honor of summer, I’ve included a refreshing non-alcoholic drink, Watermelon Lime Agua Fresca, courtesy of the How Sweet It Is blog. I found this on Twitter in May, and it still moves me every time I watch it. A girl in Birmingham, England came to school with a new prosthetic blade. How did her classmates react? His parting comment: “…remember this day for the rest of your life. No matter how many bad people there are, there are always people that will help you in the long run.” WOW! Such wise words from an 8th grader. Click this link to read the whole story. Ever since National Stationery Month in April, I’ve candidly become a bit obsessed with cards and letter writing – much more so than what I expound upon here at The Appreciation Factor. I’ve told you in the past how much impact a handwritten note can have, so you’ll quickly see why, this story about Girls Love Mail, an organization that sends handwritten notes of encouragement to women newly diagnosed with breast cancer, made such an impact on me. I think I’m going to have to write a few letters myself for Girls Love Mail and join their 2017 Miles of Mail campaign (as of this post, Girls Love Mail is on Lap 2 with over 9,400 letters received, and over 92,000 have received a letter since the group’s founding in 2011!) Truly, when more has a letter meant so much? While you may have distinct opinions on Netflix’s 13 Reasons Why and it’s depiction of a girl who commits suicide and who she blames, I promise this is not story is not a downer. Much has been said about 13 Reasons Why and how it glamorizes suicide. I personally did not have that take away but I know younger audiences could walk away with different ideas from this program. This is why I wanted to share a story of Oxford, Michigan, who turned the story around to be, 13 Reasons Why Not. The school wanted to address suicide, bullying, depression and other challenges teens face, with a positive twist. Select students from Oxford High School were picked to tell their story and to thank a friend/friends for bringing hope and inspiration to their lives. You can listen to this NPR Youth Radio feature: 13 Reasons Why Not (Listen here). One pile found on Martha’s Vineyard. Source: Backwater Trading Co. Ever a fan of acts of kindness, this one won me over immediately. It’s probably because I also collect rocks – primarily heart-shaped rocks, but still find a nice rock can really make my beach day – even one without any writing on it. The thought of finding one with an inspirational message… wow! It all started when Meagan Murphy wrote some inspirational messages for friends on rocks she found on her local Cape Cod beach. Inspired by the positive reactions she received, she started leaving inspiration rocks for strangers to hind on her local beach. So many people were moved by them, that they started to leave their own. Now formally, The Kindness Rocks Project (www.thekindnessrocksproject.com) it’s expanded across the US and rocks have been left/found in over 10 countries! 2. Recruit every person who stumbles upon one to join in the pursuit of inspiring others through random acts of kindness. What a great reminder to always act as kindly as possible, and share inspiration in places one may not expect it. How can you get involved? Anyone and everyone is welcome to participate – no registration is needed. Simply decorate a rock and leave it for the next person to find. Doesn’t get much easier than that. Place the watermelon, lime juice and zest, sugar, salt and ice in a blender. Blend until you have a slushy consistency and the mixture is cold and frozen. You can taste and add more sugar if desired. I’ve tried this and it’s Ahhhhhmazing! Can’t wait for the really good summer watermelon to come out! I’m also thinking about adding some Mint to this too! Let me know what you think! What did you think of this issue of Thankful Thursdays? Have a link you want to share for my next issue of Thankful Thursdays – Share it in the comments section. Categories: Random Acts of Kindness, Thankful Thursdays | Tags: 13 Reasons Why, 13 Reasons Why Not, Air Jordans, Girls Love Mail, Handwritten notes, How Sweet It Is, Inspirational Notes, inspirational quotes, kindness, Kindness on Cape Cod beaches, Meagan Murphy, Middle Schoolers Making A Difference, Thankful Thursdays, The Appreciation Factor, The Kindness Rock Project, Watermelon Lime Agua Fresca | Permalink. This week is Random Acts of Kindness (RAOK) Week (2/12 – 2/18). It all leads up to National Random Acts of Kindness Day on Friday, February 17th. However don’t forget about the 18th! While not confirmed, it’s believed that Random Acts of Kindness originated when Anne Herbert wrote, “Practice random kindness and senseless acts of beauty” on a place mat in a Sausalito, CA restaurant in 1982 or 1983. Later when Random Acts of Kindness, True Stories of Acts of Kindness, was published in 1993, it set off a chain reaction of support. Americans were inspired to take part after TV, radio and newspapers broadcast/published segments and articles on the subject. To me, practicing RAOKs is akin to showing appreciation. You’re appreciating those around you by letting them know how much they mean to you – even strangers to whom you may be wordlessly saying, “Hey. I see you! We’re in this together. Here’s something nice for you.” So I try to practice carrying out random acts weekly, but I am always up for focusing my efforts on a greater scale when this week focused on kindness comes along . You may feel overwhelmed by the task I propose, and are saying, “What can I do?” or “I’ve never done anything like this before.” Never fear I have a few ideas for you. Categories: Random Acts of Kindness, Showing Appreciation | Tags: Random Act of Kindness Ideas, Random Acts of Kindness, Random Acts of Kindness Week 2/12 - 2/18, RAOK, RAOK Ideas, Showing Appreciation through Random Acts of Kindness, The Appreciation Factor | Permalink. How Will You Contribute/Share Your Kindness? Friday, November 13th, is World Kindness Day. I’ve been looking forward to this day for almost a year, having just missed it last year. Not be deterred, I printed a reminder and put it in my new day timer right away. I know this blog is about Appreciation first and foremost, but I’ve always felt that kindness can beget gratitude/appreciation, and that showing/expressing our gratitude can also trigger kindness. Kind of makes a nice circle don’t you think? and strive to create a kinder world. 4. Surprise someone in your network with a reference on LinkedIn. You likely have many in your LI network or otherwise whom you could write a glowing recommendation. Idea courtesy of Jenn of Work Wonders Coaching. 5. Put 25 – 50 paper hearts or smiley faces in a box/jar. On the back of each one, write something that is special about your lover or a good friend. Give her/him the box and tell her to pull out a heart or smiley face anytime she gets lonely or wants a pick me up. 6. Have an Amazon account? Did you know that you can donate money to your favorite US non-profit through Amazon Smile. Amazon will donate 5% of the price of your eligible Amazon Smile purchases to the charitable organization of your choice. I just set this up and it took less than a minute! Write a letter to a deployed or wounded member of the military through Operation Gratitude. Soldiers say that’s the most meaningful part of care packages they receive. On Facebook? You can send your thanks to military members through Military Facebook pages. 8. Say thank you to those that you see every day, but whom may not work “with” you. Everyone is important from the office security guard and the person at the front desk to the mailroom clerk and cleaning staff. Get to know their names and greet them by name. It also never hurts to say thanks for their services as you likely would have a completely different office without them. Plus we all like to feel that our efforts are appreciated. 9. Looking for something on the Internet? Instead of simply turning to that popular search site, use Goodsearch to search the internet, play games or answer survey questions. 50% of their ad revenue and/or 1 cent for every search is donated to charity. 10. Printing some coupons before you go on a shopping spree? Print out a few extra (when you can) and bring them along. You can surreptitiously leave them in the store for others to find, or hand out to a fellow customer who looks like they could use one for their purchases. 11. Create some inspirational quotes or signs and place them around the office or in your colleagues’ work spaces. You never know when someone may need that pick-me-up. 12. Make an impact for those who need help by visiting Free Rice, a United Nations Food Program that donates rice to hungry people when you interact with the web site. Gratitude increases mental strength. For years, research has shown gratitude not only reduces stress, but it may also play a major role in overcoming trauma. Will you celebrate World Kindness Day and help make the world a kinder place? What ideas to you have to show your kindness, random or deliberate? Share them with me and my followers! Categories: Holidays, Random Acts of Kindness | Tags: Amy Morin, appreciation, appreciation triggers kindness, free ideas for showing kindness, gratitude, Ideas for showing kindness, kindness, November 13th, Random Acts of Kindness Foundation, RAOK, The Appreciation Factor, Work Wonders Coaching, World Kindness Day, World Kindness Movement | Permalink. Thankful Thursdays – A New Feature! Two posts in a week!? I’m spoiling you for sure, but let’s think of it as a random act of kindness on my part and a way to share some great links – one of which can help you plan your Friday and Saturday! Categories: Random Acts of Kindness, Thankful Thursdays, Things to appreciate | Tags: #AMOK, Annual Melee of Kindness, Birmingham Spiderman, Bruno Mars, Carson Dean, global kindness days, Happiest Place on the Internet, Mark Ronson, Random Act Org, Rosa's Fresh Pizza, Thankful Thursdays, The Appreciation Factor, treadmills, virtual hug | Permalink. Perhaps in needing some inspiration myself this week, I wanted to share 4 links that have moved me or which have inspired me to share my appreciation of them. Each is a reminders that kindness is out there and can is making a difference. I’m even considering making this kind of share a periodic feature called “Thankful Thursday” but as it’s Friday – Friday Favorites?? The program creator Glen Marais, challenged students to be kind for 30 days starting on January 30, 2015. 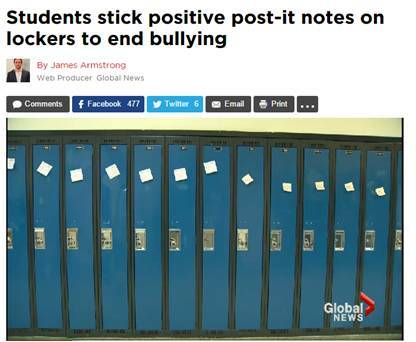 Several of the students felt that everyone should be made to feel special and took to writing and affixing uplifting, positive messages on each and every locker. The goal: Communicate that Bullying is Unacceptable. It was meant to conclude with Pink Shirt Day (see pink inset) on February 25th but per the program has been well received it at this school it continues on. 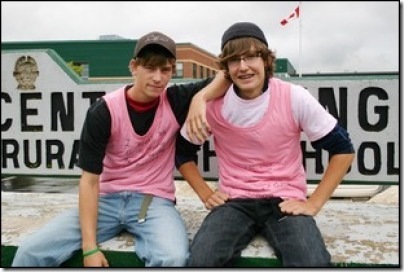 In 2007, David Shepherd and Travis Price of Nova Scotia stood up for a boy who was bullied simply because he wore a pink shirt on the first day of school. How did they do it? The second day of school, they both wore pink shirts and distributed pink shirts to all of the boys in their high school. The pink shirts have gone on to symbolize that “we will not tolerate bullying anywhere” and has Pink Shirt Day has been celebrated annually in Canada ever since. Visit the Pink Shirt Day site here. In 2012, the United Nations declared official Anti-bullying day as May 4th. It’s celebrated in the US, Australia and the UK. Unless you live under a rock, hate football or use commercials for food breaks, I’m sure you’ve seen the “Make it Happy” Coke ad that played during the Superbowl. I’ve been waiting to be able to talk about this. I LOVED THIS AD. While some may say, “well what can it really do?” I found it very unexpected. At first I couldn’t understand why a Coke would be promoting cyber bullying and hatred… but then the twist. I loved the idea of a product we’ve seen marketed to bring “a smile” could be used to make that smile last. My favorite vignette, the boy on the bus. It may be only an ad, but if the 1000’s of visitors and pledges on their www.gomakeithappy.com site is any indication, maybe Coke’s ideas and taking these small steps (pledges) can make a difference. It would be nice wouldn’t it? I’d definitely like to see a change both in bullying and in the nasty, negative comments online. Let’s see if we can create a positive ripple effect. I hope my followers and their friends (pass it on) will pledge how we’ll “make it happy.” As I say on Twitter: #smallactbigchange. I’ve watched this Thai Insurance video over and over again since seeing it first on a blog (which I cannot locate anymore to credit as the source. – Sorry if it was on yours!) I did find it on YouTube. Sure it’s a commercial, but I love watching how small things like helping a women with her cart, started to make her day, and encouraged her to give something back (watch for the extra rice! ), as well as the touching end with little girl. It illustrated, at least for me, how my small acts of kindness can create such deep and ongoing positive changes, many of which I may never see. And finally, I found this great post on Relephantmatters that shared a different way of paying for a stranger’s coffee. 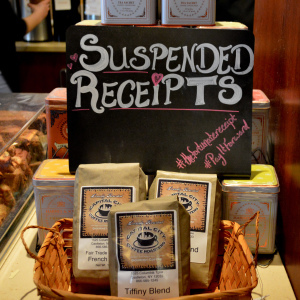 For the month of February, customers of the Fortunate Cup Coffee Cafe in Saratoga Springs, NY have been encouraged to leave their change or make a donation to something they were calling “Suspended Receipts.” The collected funds would be used to pay it forward by contributing to, or paying for, someone else’s cup of coffee. This is a new spin on, “I’m also covering the person’s purchase behind me,” don’t you think? As of February 1st, …. all the do gooders [sic] who can spare change for a random act of kindness [leave it as a suspended receipt]. This month we will provide customers with the opportunity to suspend receipts to provide a complimentary drink or meal for a stranger…. It’s our way of showing customer appreciation and connecting strangers through genuine care for our community. It gets better! They’ve also promised to continue accepting donations after February which later may be used to buy meals or provide other assistance for those less fortunate and/or those who may need temporary assistance. Think of how much one single cup, or a few dollars to help with a bill if a family member is ill could improve someones day? Go New Yorker’s! Go Fortunate Cup Coffee Cafe! Were you inspired by any of this or nah… it wasn’t enough, it won’t do much? Categories: Random Acts of Kindness, Thankful Thursdays | Tags: Anti-bullying, bullying is unacceptable, Coke Make it Happen, David Shepherd, Fortunate Cup Coffee Cafe, Pink Shirt Day, Random Acts of Kindness, Relephantmatters.wordpress.com, Say My Name Canada, superbowl ads, superbowl commercials, Thai Insurance, Thankful Thursday, The Appreciation Factor, Travis Price | Permalink.